To celebrate Canada’s incredible writing talent, Indigo is thrilled to launch a movement called #ReadtheNorth. By shining a spotlight on Canadian authors and their works, Indigo hopes to inspire booklovers of all ages to develop a deeper appreciation for Canadian literature. 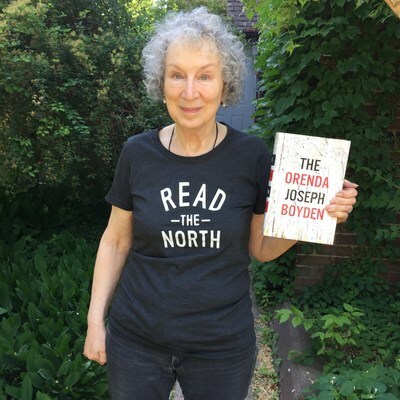 Acclaimed novelists and poets like Margaret Atwood, Joseph Boyden, Leonard Cohen and Alice Munro represent a small but significant portion of Canada’s celebrated and diverse literary community. Several Canadian authors sat down with Indigo to share their perspectives on the power of literature to connect readers all over the world. The Orenda by Joseph Boyden: A visceral portrait of life at a crossroads, The Orenda chronicles the intersection of three characters’ paths: a young Iroquois girl, her captor who is one of the Huron Nation’s great warriors and statesmen, and a charismatic Jesuit missionary. As these three souls dance each other through intricately woven acts of duplicity, small battles erupt into bigger wars and a nation emerges from worlds in flux. Alias Grace by Margaret Atwood: In Alias Grace, bestselling author Margaret Atwood takes us back in time and into the life of one of the most enigmatic and notorious women of the nineteenth century. Netflix and CBC have partnered for a six hour miniseries based on the 1996 Giller Prize-winning book. The Idea of Canada: Letters To A Nation by David Johnston: From our present Governor General, a series of 50 (of several thousand) carefully chosen letters he has written to people he has admired and befriended over his seventy-plus years, that sets out Mr. Johnston’s frank, informed, and novel thoughts about Canada. Milk and Honey by Rupi Kaur: Milk and Honey is a collection of poetry and prose about survival, about the experience of violence, abuse, love, loss, and femininity, from Canadian poet Rupi Kaur. The Reason You Walk: A Memoir by Wab Kinew: This moving father-son reconciliation is told by charismatic First Nations broadcaster, musician and activist, Wab Kinew. By turns lighthearted and solemn, Kinew gives us an inspiring vision for family and cross-cultural reconciliation, and a wider conversation about the future of aboriginal peoples. An Astronaut’s Guide to Life on Earth by Chris Hadfield: As Commander of the International Space Station, Chris Hadfield captivated the world with stunning photos and commentary from space. In his book, Hadfield offers readers extraordinary stories from his life as an astronaut, and shows how to make the impossible a reality. Station Eleven by Emily St. John Mandel: An audacious, darkly glittering novel about art, fame and ambition set in the eerie days of civilization’s collapse, from the author of three highly acclaimed previous novels. Alone Against the North: An Expedition into the Unknown by Adam Shoalts : When Adam Shoalts ventured into the largest unexplored wilderness on the planet, he hoped to set foot where no one had ever gone before. What he discovered surprised even him. The High Mountains of Portugal by Yann Martel: This is a suspenseful, mesmerizing story of a great quest for meaning, told in three intersecting narratives touching the lives of three different people and their families, and taking us on an extraordinary journey through the last century. A Complicated Kindness by Miriam Toews: Winner of the Governor General’s Award and a Giller Prize Finalist, Miriam Toews’s third novel has earned both critical acclaim and a long and steady position on our national bestseller lists. To view a selection of #ReadtheNorth books, click here. Hey Buddy!, I found this information for you: "Indigo invites Canadians to #ReadtheNorth with the best Canadian books". Here is the website link: http://shesinfluential.com/2016/06/29/indigo-invites-canadians-to-readthenorth-with-the-best-canadian-books/. Thank you.